Thank you for purchasing our Q-Series Reverse Osmosis Unit. The unit is designed to be as easy to install as possible. The instructions are a little detailed because of the number of parts. Don't hesitate to call for advice if you get stuck. Before beginning, please take a moment to review the contents of the box to ensure that your unit is complete. A set of open end wrenches and/or a couple of good crescent wrenches. Here are the steps that must be completed to install your new RO unit. You don't have to follow this order, but it is probably easier if you do. For each step, follow the instructions included with the associated kit. Establish a source of water for the RO unit by installing the inlet valve. Setup the unit & tank. Place the storage tank and the RO unit where you want them under the sink. The unit can be wall mounted or simply stood in a secure location. Remember that you're going to have to service both the tank and the RO unit, so avoid making them inaccessible. 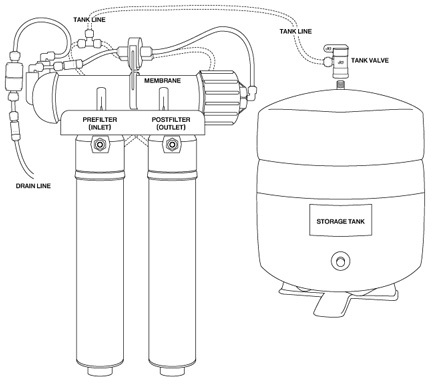 Complete the installation by attaching the tank, inlet, drain and faucet tubing to your unit. The inlet tube is attached to the front of the pre-filter housing. The faucet tube is attached to the front of the post-filter housing. The drain tube is attached to the drain saddle installed on your drain pipe. The tank tube is attached to the tee fitting on the top of the unit. Once these connections are made, the unit is installed. When all connections are made, start the unit by the following procedure. Open the ledge faucet and leave it open. Leave the tank valve open (blue handle parallel to the tubing). Turn on the inlet valve and let water flow into the unit. Gurgling and hissing are normal. After fifteen minutes or so, water will begin to drip from the open faucet and eventually level off to a small stream or fast drip. This is normal. Allow water to drip from the faucet for about an hour to thoroughly rinse the membrane, then close the faucet. Water will now begin to collect in the storage tank. Allow water to fill the tank for two or three hours, then open the faucet and let the tank empty. Again, gurgling, hissing, and spluttering are normal. When the faucet returns to the small stream or fast drip, the tank is empty. Close the faucet and let the unit collect water. You can now use the unit at any time (although you won't have a lot of water for a half hour or so). Operation of the unit is fully automatic from this point. As you use water, the unit will turn on automatically and refill the tank. Tip: Sometimes trapped air will cause cloudy water. This is not a health issue and it will soon go away. No maintenance should be needed for a year. When the unit is a year old, we'll send you a postcard reminder that it's time to change the vertical filter cartridges. Quick connect fittings make an easy and extremely secure connection. They can be used on copper tubing, but work best on plastic. Be sure the end of the tubing is cut square, then push in until you feel the tube hit bottom. Should you need to remove the tube, push in on the collet (the small plastic collar that encircles the tube) with your fingernail and pull the tube out simultaneously. If the unit has been in use, you will not be able to remove the tube from the fitting if water pressure has not been released. If you remove a tube and reinsert it, it's a good idea to trim off a small portion of the end of the tube to assure a leak-free reconnection.